Our Verdict: A true convection portable vaporizer, the Elevape Smart is virtually indestructible with its aircraft grade aluminum construction and top notch build quality. Most importantly, it performs well with no lag; and is stylish and discreet enough to take anywhere. Design: Created and designed by a company named iPuffUSA, the Elevape Smart is a well-designed device about the size of a cigarette pack. It has a matte black finish with a switch labeled 1, 2 and 3, and a USB charging port. What will befuddle users at first glance is the lack of a power button, or any other buttons for that matter. This is because the device is activated by inhaling through the mouthpiece, which is very rare in the vaporizer market. There is a short mouthpiece on top, and the overall unit is very minimalist and highly portable. Build Quality: The Elevape Smart is very tough. It is made out of aircraft grade aluminum, and all parts are machined well with no loose fits anywhere. The finish is glass bead blasted and anodized so it will not scratch easily, and there are no plastic parts anywhere. If one were to drop it on a busy highway, and it got run over by a fleet of cars, it would still work flawlessly. Users won’t ever have to worry about the unit failing. The device is also backed by a one-year warranty for the heating element and a lifetime warranty on its electrical components. 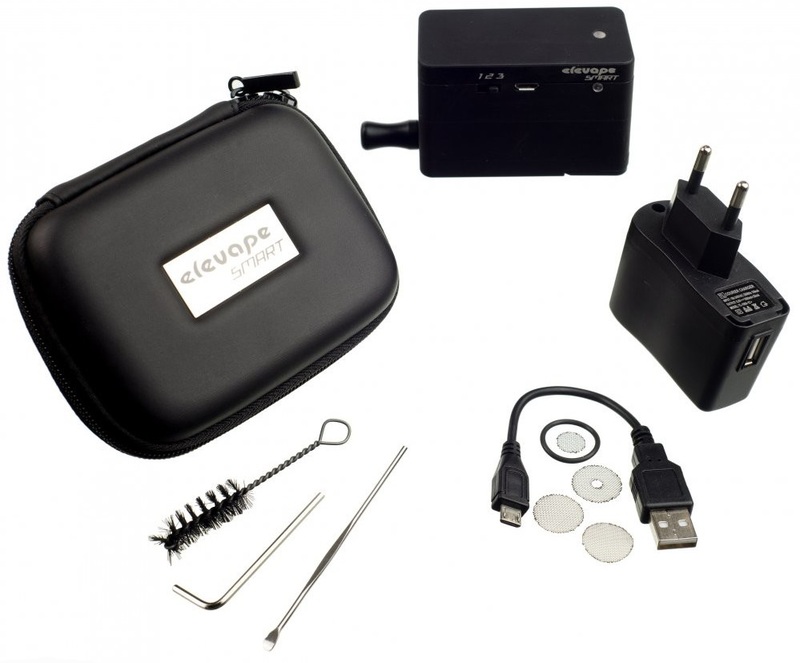 What’s in the Box: Users who purchase the Elevape Smart Vaporizer also get one mouthpiece, one wall charger, one USB adapter, one cleaning brush, one stir tool, one maintenance tool, two replacement screens, one rubber o-ring, and one carrying case. Usability: The Elevape Smart is very easy to use straight out of the box. However, the device’s usability is made even better if one downloads the computer app (Mac or PC) for it. While the device comes with three preset heat settings, users who download the app can personalize these settings for optimal efficiency. The app also has usage tracking, and updates the user for software upgrades and other interactive features. It is a powerful tool to have, especially for vapers who are serious about their dry herb and usage. Users who do not care about the app or its slew of features can still get a lot from the Elevape Smart, though, and usage is very straightforward. A magnetic lid covers the heating chamber, which is where users fill the device with their ingredients, and it can be removed just by twisting it off. Once filled, return the lid, set the switch to “1” then inhale. Vapor is instantly produced, and users can switch between the three heat settings any time. There is no heat up times which adds to the overall value of the device, no matter the temperature, the device fires instantly. No fuss, simple to use, and very efficient – well worth the $350 price tag on it. Vapor Production and Performance: Vapor production from the Elevape Smart is excellent. The device is a convection unit, and the heating element is situated very close to the herb. This gives users a very pleasant, tasty, and smooth vape. The density of the vapor depends on the temperature set (like in the box mods) and how one draws, but overall, the Elevape is a great performer. Beginners will have no problem getting started with this, and advanced users will find it capable enough to replace their old main vaporizers. Battery Life and Atomizers: The battery inside the Elevape Smart is amazing. It recharges in about five hours, and once fully charged, can last the whole day of vaping. The battery itself is a custom-made, six-cell, 1200mAh battery that has a 20C discharge rate. What this means is, it packs enough power to produce instant vapor and maintain its temperature no matter how one draws. The heating coil is made of titanium alloy, which can last a long time. A microprocessor monitors the heat and checks the coil about 100 times a second to ensure constant temperature within the chamber. It adjusts the heat as needed with each draw, making sure that the cool air that comes with each inhale is compensated for properly. Temperatures are set via the app, though if one is satisfied with the default settings, one can just leave it as it is. The chamber itself is large and easy to fill as well. In all, the Elevape Smart has a very high-tech heating element that outperforms most vaporizers, regardless of size or price. The Elevape Smart Vaporizer is well-designed, highly thought out device, both in aesthetics and functionality. It may look simple on the outside, but inside, the unit is a work of art. The app gives users a high level of customization while the device itself gives excellent performance that is difficult to match by any other portable vaporizer. The price may be a bit high, but if one considers the quality of performance, combined with the smart design and virtually indestructible build quality, $350 will seem like a steal. Beginners and advanced users will find that the Elevape Smart Vaporizer is one great device that will last them a lifetime. An intriguing vaporizer in a boxy shape, the Sonic Vaporizer is full of promise. Does it deliver on that promise? Read on to find out.